Of all the Megacorporations, Mishima holds itself most closely to the ancient traditions of its origins.Mishima suffered badly during the Fall because so much of their wealth had been accumulated through the design of microprocessors and the generation of powerful AI's. But as history has repeatedly shown, Mishima has a remarkable capacity for resilience. Their adherence to duty has seen them accomplish many things that other Megacorporations considered impossible, not least of which was the successful settling of the infernal world of Mercury. 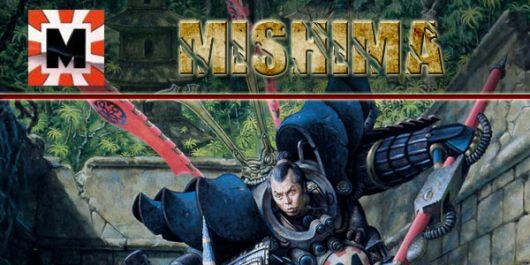 The Mishima Megacorporation has a completely unique mindset; one that is rigid and elegant but also completely unforgiving, these values are prized by even the most lowly of their citizens. It is this introspective method of thought that has led them into much controversy over the centuries. Most memorably of all, the rift that sprang up between Mishima and the Brotherhood during the Neronian Heresy. This division is not entirely healed, even to this day. Following the divergence of Mishima from the teachings of the Cardinal, Mishima established the "Schools of Enlightenment", which many see as an act of heresy. The Brotherhood however, saw no evidence of the Dark Symmetry in the schools and so tolerated their existence. This was seen by many in the Curia as a wise move as it allowed Mishima to concede the Brotherhood's spiritual authority without losing face. Others see it as a display of The Brotherhood's weakness and a sign that Mishima are falling ever closer into shadow.